CompuTec WMS 2.0 is on its way and today I would like to give you a preview into what you can expect from it. We have yet to meet two companies who run their warehouses in exactly the same way and our development team keep this at the forefront of their mind throughout the entire development process. 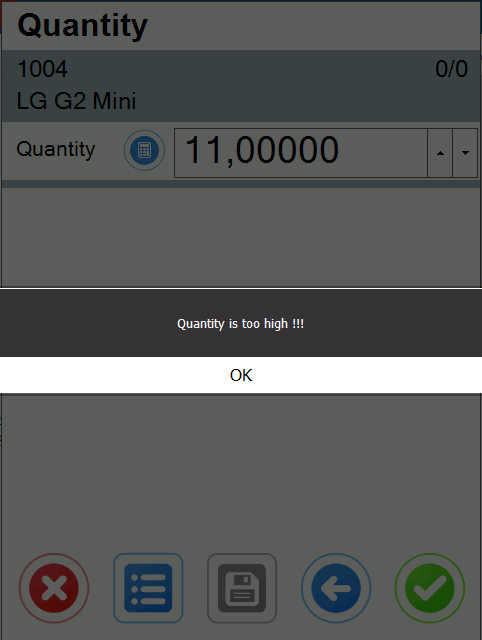 Never has this been truer than in CompuTec WMS 2.0. In this version the ability to tailor our solutions to your way of running your business is definitely the name of the game. 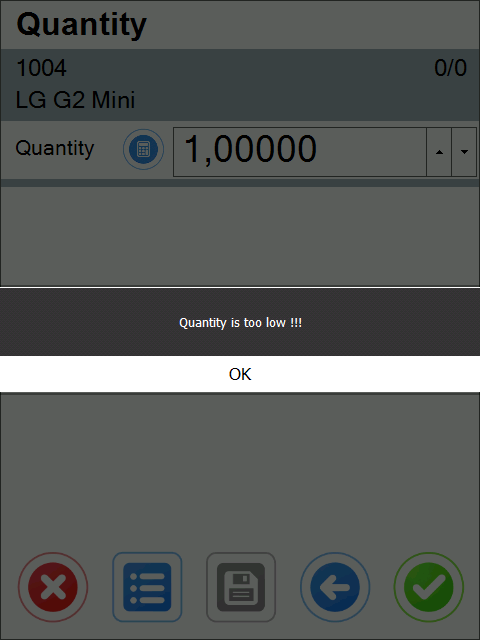 Along with the new WMS User Defined Fields Manager, a new approach to Validation opens up a myriad of opportunities to tighten up your warehouse operations and eliminate countless mistakes and miscommunications along with their sometimes quite serious consequences. Validation is, simply put, a checking process which ensures the correct data is entered into your system. It ensures that all the data you need is collected and that transactions can only be carried out under the correct conditions. But doesn’t validation already exist in SAP Business One? Yes, it can be defined but validation in CompuTec WMS is far faster and makes life much easier for the user. Let me expand on that. In SAP Business One, validation can only be performed when you try to save a form. This means that any errors in the form are only detected when you have filled in the entire form and if there are any issues you then have to go back through all the data you have entered and hunt them down which can be a bit of a frustrating process. CompuTec WMS alerts you to incorrect fields as the values are entered so you will always know that the alert you receive is about the field you are currently entering data into which takes a lot of the hassle out of data entry input. Secondly I mentioned that validation in CompuTec WMS is faster. This is because any one form can have multiple validation checkpoints (fields on which validation should be performed) so when you save the document, SAP Business One then goes through all of the checkpoints one after the other. If a form only has two checkpoints on it, the form will be saved pretty quickly but if you have maybe 10 or more checkpoints on the form, it takes much longer for your system to save the document every single time, even if all the data is perfect. Again because CompuTec WMS will alert you as soon as any invalid data is entered, you skip that entire sluggish process so you can save your data very quickly and get on with the next task. Absolutely not. Anyone competent in SQL queries can set up validation on any CompuTec WMS, ProcessForce or User Defined Field in a matter of seconds. 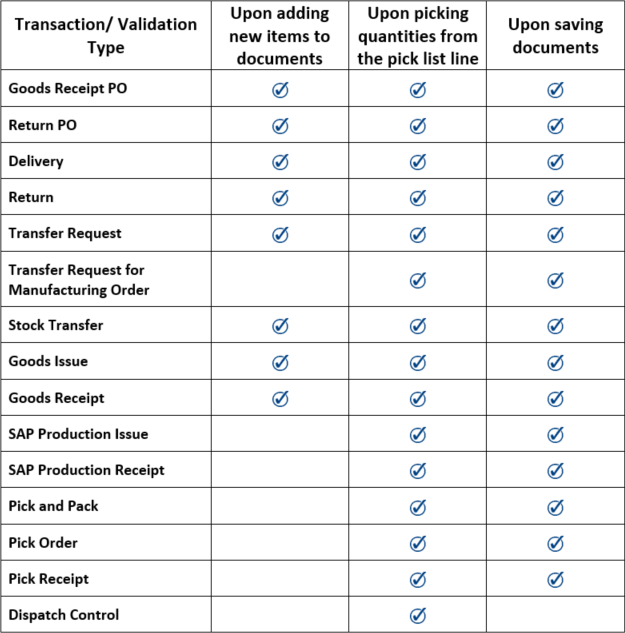 On which warehouse transactions can validation be performed? The validation process in CompuTec WMS can be carried out on any CompuTec WMS, CompuTec ProcessForce or User Defined Field. The table below summarizes on which forms and transactions CompuTec WMS validation is available. In what circumstances would this be useful to me in my warehouse? The great thing about CompuTec WMS Validation is that how you can use it is only limited by your needs and your imagination. There really is such a huge scope for deploying it that I couldn’t possibly describe them all here but I will give you a few examples. This is very, very far removed from an exhaustive list. If you have something particular in mind, please do get in touch with us and we’ll be glad to tell you if the scenario you envisage is a possibility. You can reach us by email, telephone on +48 68 38 188 00 or by using the contact form at the side of this page.